Jeb Bush is the anointed one and his dynasty’s fall from power is a stunning story. With $100 million collected from Wall Street predators he was to ascend to the throne as easily as his brother W. had. But Jeb ran smack dab into a brash New York billionaire an an attractive protege who thought it was his time. Why is Jeb cratering and what are his dark secrets ? New York Times bestselling author Roger Stone has the answers! This is the inside story of Jeb’s world of privilege, elitism, plunder, enrichment, fraud, drugs, Intelligence connections, shady business deals and self dealing as Governor. But this book so much more. This is the real-life horror Story about one of America’s most secretive political dynasties.From the Civil War right up to the War on Terror, the Bush family has ruled from the shadows as well as from the main stage of international politics. In only four generations, the family has reached prominent positions—two presidents, one senator, two governors, and a director of the Central Intelligence Agency—and now another family member is making a faltering bid for the White House in 2016. 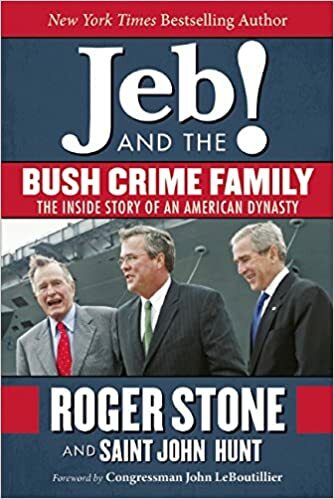 Jeb and the Bush Crime Family refutes the air-brushing of the real George “Poppy” Bush by his authorized biographer Jon Meacham and the “quickie” bio of Bush 41 by Bush 43, put out to help Jeb ascend. These books whitewash the true Bush record of crime, drugs, adultery, and a ruthless pursuit of power. Jeb! Drops Out! Trump Soars to Victory!